Port Authority bus routes and rail lines cover the city of Pittsburgh and surrounding Allegheny County. Many bus routes run through the Point Park campus and the light rail line has stops a few blocks away. Students who commute to Point Park can find one or more routes that get them to and from campus as their schedule requires. Students who live in Point Park residence halls can use Port Authority buses or light rail to reach destinations elsewhere in Downtown Pittsburgh or Allegheny County. The University's commuter resources page includes information on Port Authority bus schedules and passes, Downtown parking locations and discounts. 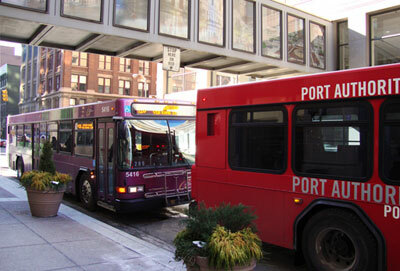 For route, schedule and fare information, visit the Port Authority of Allegheny County website. Beyond Allegheny County, the Port Authority also lists mass transit systems for outlying areas of Western Pennsylvania.